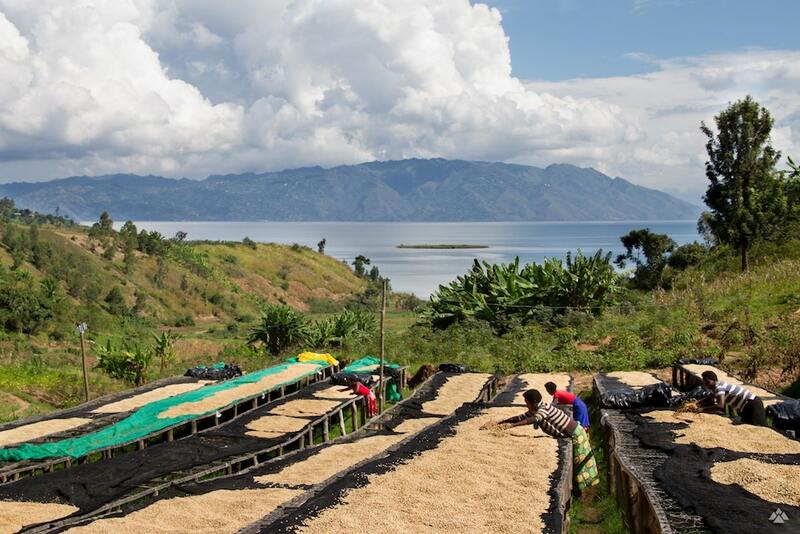 Overlooking beautiful Idjwi island and Lake Kivu, the Gisheke coffee washing station’s drying beds are perfectly situated to receive light winds off the lake. Gisheke receives much of its cherries from farms on the islands on Lake Kivu. These cherries are brought to the washing station by boat, and forty percent of the cherries come specifically from the Island of Bushungwe. After cherries are brought to Gisheke, they’re pulped in a machine pulper. Cherries are floated in fermentation tanks overnight, for approximately 12 hours, and then workers perform “ikinimba” a tradition in where they sing five songs while dancing and stomping on the coffee to clean off the last of the mucilage. This is intended to bring out more sweetness in the coffee. Beans are then graded from A1 to A4 using channels based on density and size. And finally, the beans are dried for 40 days on raised beds. Muraho is helping Gisheke farmers prepare for future crop cycles with a nursery of 43,000 red Bourbon seedling that it will distribute to farmers in October 2018. Muraho staff also offers training in agricultural practices, to help producers increase their crop yields and income in future years, especially with their new seedlings.